I recently had a chance to visit the physics department of my Alma mater where I obtained an undergraduate degree in physics. Although my conscious reverence for the physical sciences has continued, because I did not continue in the field, I never developed the intimate connection that follows from day to day immersion and a career's worth of scar tissue. Sadly, what I realized from my visit was that I have too long been distanced from the wonderfully profound emotional reactions that follow from exposure to technology and to scientific genius. 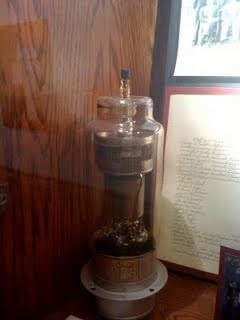 This large electronic tube was originally used in WWII (note JAN, Joint Army-Navy on the base) to activate radar transmitters. The transmitters generated short pulses of electromagnetic waves that when reflected determined the location of enemy airplanes. No semi-conductor device today has the performance capability of the hydrogen thyratron. This particular tube was replaced by tube type CX1140L and is used in electron linear accelerators, a major tool in the treatment of cancer. Seriously, look at this thing. Would you ever think you could use it to detect enemy airplanes much less to treat cancer? Such a device contains the fruits of thousands of years of human effort not only to comprehend and harness nature but also to literally battle the forces of philosophical and political ignorance. All around us today, in the midst of the latest economic crisis, we are offered the smoke and mirrors of government created fiat money - the tortured machinations of the political alchemists who seek to turn lead into gold or equivalently, consumption into production. Lost in this noise is the near truism that to progress, we must think and produce actual things which make are lives longer and better. There is no shortcut. It reminds me of a quote (unattributed) that I recently heard: "People will do anything to save the world ... except take a course in science." Doug, I'll share some fodder for an essay. Rearranging molecules and forming uniquely different combination is truly the sign of humanness. Be it vibrating air molecules with speech, arranging dots of ink on a page, placing steel beams in a tightly ordered arrangement or setting flame to a mix of volatile molecules at discharge port of a rocket, when done fully in accord with nature, it can become historic. Done wrong, forgotten or burning rubble is the result. When it is a Declaration of Independence, a Gettysburg address, a towering skyscraper or a shuttle launch they are all signs of inventive human beings,sharing their thinking with a sometimes awestruck audience. It's astounding how uncomplicated progress is. The mind numbing conversations I have witnessed as it relates to the machinations of central banks really is a form of modern alchemy. I really think that they think that somehow they can get something for nothing.